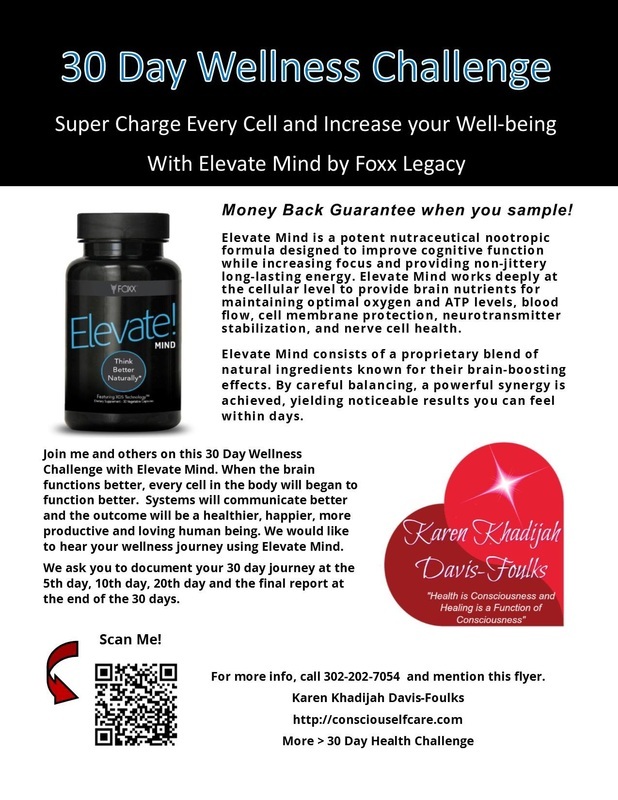 ​To purchase Elevate Mind with Money Back Guarantee and not join the 30 day Wellness Challenge When you click the link www.foxxlegacy.com/4celllife, select Join, select Referring Customer. Take your time and complete the process. Then go to your new website and order your products. Come back and send me a report sharing your experience. Read on for information on Wellness Challenge! The company Foxx Legacy has made an outstanding offer to YOU -- money back guarantee when you sample Elevate Mind nutraceutical. At the core of better health is energy and endurance. During this 30 day wellness challenge you will feel a sense of calmness, increase your energy, reduce cognitive fatigue, clear inflammation, increase oxygen levels, feel more relaxed, feel more self-assured, increase electricity breaking up TPP, power up the cell pump, the mitochondrial, eliminate mitochondrial dysfunction. YOU will keep your human body-field super charged for a greater feeling of well-being. Join me and others on this 30 day wellness challenge with Elevate Mind. When the brain functions better, every cell in the body will began to function better. Systems will communicate better and the outcome will be a healthier, happier, more productive and loving human being. We would like to hear your wellness journey using Elevate Mind. We ask you to document your 30 day journey at the 5th day, 10th day, 20th day and the final report at 30 days. Send us a wellness report by completing the form below. This is considered as your personal testimony to the power of dense nutrition and conscious self-healthcare M.O.V.E.S. It doesn't matter how sick you are, what disease you have, if you are taking pharmaceuticals or other nutritional products. This nutraceutical's sole purpose is to assist the natural healing powers of the body, to remove inflammation and increase mitochondrial efficiency. You are the sole governing agency of the particle (your human body) and the only permission you need to start this 30 day challenge is an attitude of self-love and self-care. ​Our challenge starts August 1, 2016. We will have a CELL-A-BRATION in Washington DC area in 2017 with Foxx Legacy co-founder Rodger Hill and others. Are you ready to feel better and increase your wealth in the process? Click the link below and welcome aboard my friendship train to Conscious Self-Healthcare! Referring Customers receive Foxx Dollars, which are discounts credits towards future products purchases when you refer others. Free websites and tools including social media to help you learn about Foxx and spread the word. Receive instant discounts on your Foxx Legacy product purchases. Receive Foxx Dollars when others that you refer make purchases. Foxx Dollars are transferable to others. When you click the link www.foxxlegacy.com/4celllife, select Join, select Referring Customer and you will see the following information. Take your time and complete the process. Then go to your new website and order your products. Come back and send me a report telling me you are on board and why you made the Self-Healthcare CHOICE to come aboard. Joining as a Referring Customer is free. When you join as a referring customer, you enjoy all the benefits of Friend of Foxx and many others. Earn product credits for referring other customers. Becoming a Referring Customer is also the 1st step in becoming a Foxx Legacy Paid Representative. Choose a Username and start your Foxx Legacy today! If Karen Davis-Foulks is not your Foxx Legacy representative, please Click Here to locate. ​Full Transparency Foxx Legacy Compensation Plan (Don't just get healthy by yourself share the good news and make money at the same time! No upfront costs or monthly fees, keep your money! No mandatory auto-ship or front loading! Just by what you want or need. No Being Coded Out: Start earning coded bonuses from your existing team. Foxx Dollar$! Friends of Foxx and customers can earn products purchase discounts when they refer others. Continuous Pay! Pick your own pay day! Commissions are calculated in real-time and made available to you 5 days in arrears. You control when it's Paid Out. Real-time Rank Advancement: Why wait until the end of the month? Get your pay Raise Immediately!